I’ve emerged from the jet lag haze, and have finally put together my guide to LA! This is part 1 of 2, looking at my stay in Beverly Hills and West Hollywood. First stop in LA, was the iconic, and very posh Beverly Hills Hotel, this was my second stay here and it honestly never disappoints. Everything from the beautiful gardens through to the interiors, is immaculate. It’s the type of hotel that you almost don’t ever need to leave – there are four dining options on site, a beautiful pool area (complete with underwater music), a day spa, hairdresser, gym, and a cute gift shop. However if you do decide to venture out and explore the nearby areas, there’s a complimentary car to whisk you away like a movie star to your destination of choice (so long as it’s in a 3 mile radius of the hotel). There’s no shortage of places to eat in Beverly Hills/West Hollywood – here’s a guide to where we ate. A great brunch spot is Hedley’s – this casual cafe with its retro-inspired interior (interior image via @rickbhatia), offers a calming retreat from the hustle and bustle of LA. Be sure to try their blueberry whole grain pancakes! If you’re looking for Aussie-style coffee, thankfully there are lots of Australians opening up restaurants all across the US, one of those places is Paramount Coffee Project (PCP). The cool interior is thanks to Australian architect Alana Cooke. The narrow space complete with deep green tiles, and raw concrete breeze blocks, houses an equally inspired menu. The Avocado Toast (pictured below – photo via @misscathyyu) was one of the best I had on the whole trip. My partner also claimed the Paramount Breakfast (scrambled egg, hook’s aged cheddar, chili jam, worcestershire mayo, house english muffin) was the best breakkie of the trip for him. And that’s a huge compliment because he’s very particular about his breakfasts, afterall it’s the most important meal of the day, right. And the coffee is as close as you’ll get to the coffee back home, Aussies rejoice! Eveleigh is another popular restaurant for breakfast, lunch and dinner. We dined out one night and were not disappointed (tip: apparently this place gets busy, so go early when no one is around, our food came out super quick). Try the Patatas Bravas (fried russet potatoes, thyme, rosemary, sea salt, chili pepper alioli), they must have been the crunchiest potatoes I’ve ever eaten, and absolutely mouth-watering. Give me a bowl of those any day of the week. The setting is so pretty too – think rustic barn-like oasis in the hubbub of Sunset Blvd. We accidentally stumbled across The Hart and The Hunter (Palihotel’s onsite restaurant), while doing a spot of shopping along Melrose Ave. It is a delightful space with vintage-inspired interior and simple, nourishing food. We loved it so much we ate here for breakfast and lunch. I give a big two thumbs up to their Avocado Toast with smoked olive, red onion, capers, on seeded bread (yum!). And for a healthy, yet delicious lunch, try the Grains Salad with farro, crisp wild rice, honey quinoa, red onion, cucumber, mint, grapes, almonds, and ricotta salata. Those Californians sure know how to make a tasty salad. The lattes weren’t too bad either. Oh, and Palihotel could be a good place to stay – it’s a small boutique hotel with rooms appealing to a young hipster/designer crowd. Next stop on my trip, The Kimpton Everly Hotel in West Hollywood. And wow, did it impress. It’s a brand new hotel with very contemporary interiors with cool artworks at every turn, in fact the space almost felt gallery-esque. I loved the very large, open-plan lobby/bar – there were so many different nooks throughout, seating for days, and there’s even a pool table to elevate the cool factor. Be sure to pop into the lobby bar each evening for wine hour (free wine for hotel guests – woohoo!). The rooms are modern and understated – with the bathrooms being the design highlight. Oh and our room overlooked the Hollywood hills with a clear view to the Hollywood sign – very cool. This could possibly be the best hotel view of the entire trip. We ate most meals on our stay here, at Jane Q, the onsite restaurant – not just because of its obvious convenience, but the menu was affordably priced, the food delicious and the interior, dreamy. Try the Forest Mushroom Pizza! 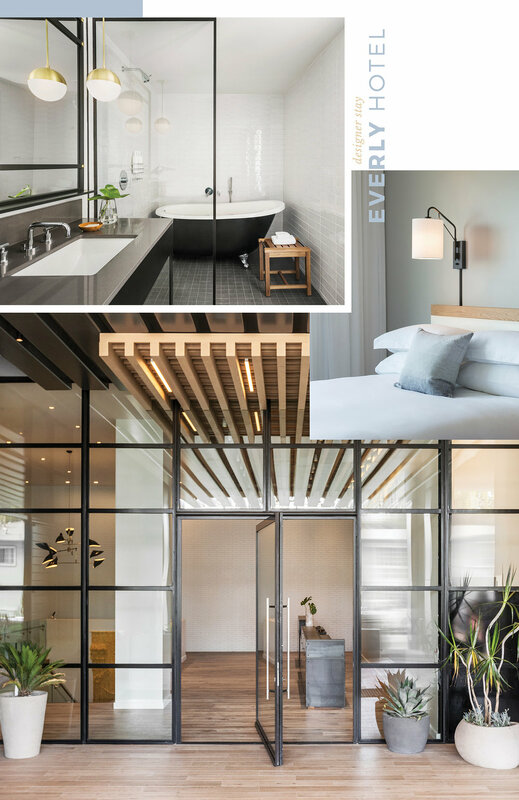 Creative types will come away from a stay at The Everly feeling inspired, and hey, that’s what a holiday should do right! For me, it was the lobby and the Skyline pool/outdoor space that really had my mind bubbling away with ideas. The photos on the website don’t do the rooftop area justice, it’s the type of hotel that simply must be visited in person to truly appreciate it. Older PostThe Fresh Edition Out Now!